I was studying in grade 9 and everything was normal. My study was just fine; I was struggling to make a website; and I was sincerely doing self-study to learn programming in Visual Basic 6.0. However, amid my normal life something went abnormal that year and it was painting. Perhaps that year is the most productive year for me, until now, in painting. 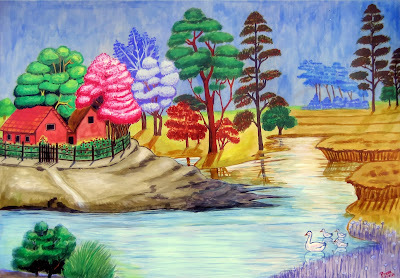 I was studying in SOS Hermann Gmeiner School, Bharatpur, then and everyone used to encourage me to do arts there as a result of which I had become capable to make paintings like these. I am very thankful to all my teachers and friends there for the constant motivation, appreciation and support they provided. Probably that was the greatest reason why I used to submit most of my arts to the school. I feel proud that my paintings still hang in the walls of the class-rooms there. However, I kept these two secretly with me as these were my best paintings! When I had completed these paintings I had instantly decided that I would be keeping them forever with me because I had considered them to be great achievements given my small age. As of now, these are the only paintings left with me from my school life and I still feel that they are my best paintings. Both of these paintings are drawn on a normal but different kinds of chart paper. The former one is much thicker than the latter one. Here, normal means that the paper wasn't made especially for arts and paintings like the cartridge paper. One of the things I admire most about these paintings is their size. Both of these paintings are in a good size - a little larger than the A2 sized paper. Similarly, both of these paintings had taken two days each for me to paint and I don't even remember how many days they took to get the outline sketch first. I used to sketch on irregular installments (so to speak!) because I used to prefer painting to sketching then however the case is just the opposite nowadays. Moreover, I have used acrylic colors on both of these paintings and that's why they have a shiny look. I don't think I knew much about acrylic colors then. I never took any official training or classes in arts although Navin Bhakta Adhikari, artist and the then art teacher in SOS Hermann Gmeiner School, used to help me occasionally especially when I had to go for a competition and I'm sincerely thankful to him. These are still my best paintings and will continue to remain so. I hope to do the same level of paintings again, and if I do so I'll definitely share them with you. What do you say about these paintings? Please leave your valuable opinions and views in the comments below. Thank you Aida for your compliments. The acrylic colors I used in these paintings look quite bright even in the dull papers. So, that's nothing amazing in that. I hope you are the same person who asked me a few questions in my GP site!